Following Arsenal’s 4-1 victory over West Ham in yesterday’s Premier League encounter at the Emirates, Arsene Wenger appeared before the media in his first press conference since announcing his departure from the club. Is he reluctant to leave the club he’s graced for 22 years? Why is he leaving now? And what next for the Frenchman? The mood at the Emirate was a mix of reserved respect and apathy for a manger who was once the world’s best and a decent team peppered with mediocrity and journeymen. 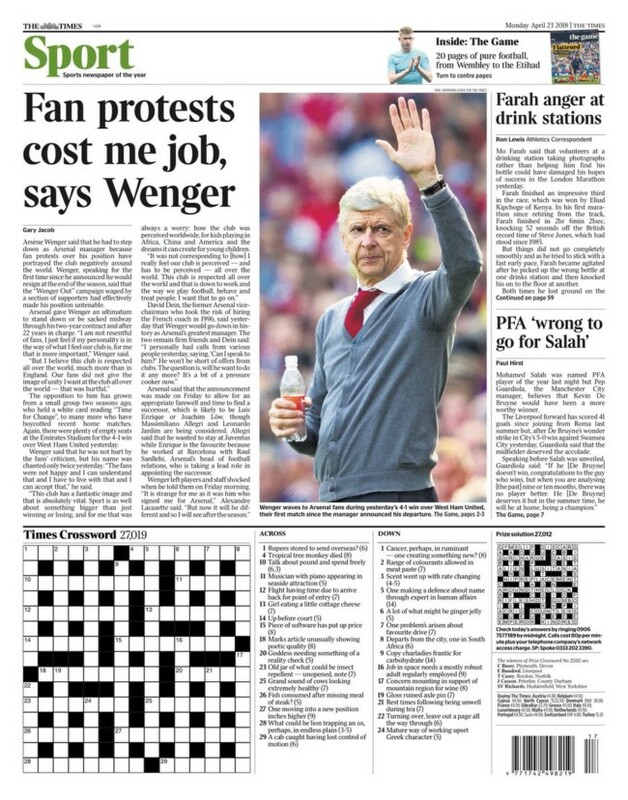 The Fans Were Chanting “One Arsene Wenger”. Some wore shirts bearing his name. I’m happy when our fans are happy. I’m even ready to suffer to make them happy. If sometimes, they make me happy as well then I’m happy. I’ll take it. Every single decision I’ve made in my 22 years is for the good and the sake of Arsenal. Even when it was the wrong decision, my one priority was to do well for the club. I tried to influence the club on the structural side, on the development of the individual players and of course the style of play and results. To combine the three is not always easy and I believe that I will leave a club that is in a very strong position on all fronts. My target was always to do that and I give an opportunity to the guy who comes in after me to do even better in the next 20 years. That’s my wish. Will He Pick His Successor? No. It’s not my decision. I always feel that the most important thing in a football club is that everybody does his job. My job is to take care of the team, of the results and of the finances in the transfers. That’s what I did. My job is not to select the next manager. Why Is He Leaving Now? I made a statement. That is basically all in it. Overall, I don’t think it’s the moment to come out on that. I would like to focus, to keep the priorities right until the end of the season and focus on how well I can do until the end. I will speak about that a bit later in my life. No, not really. It’s a mixed feeling. First of all I must say that I’m touched by all the praise I’ve got from all English football and I’m grateful for having that experience in this country. That for me is very special. The football is special, the passion is special and you’ll find that nowhere else. I know that I will not get that anymore in my life. Of course that is absolutely special and the fact that I could see the development of the Premier League in 20 years is sensational. I hope that will last a very long time. After that I had the feeling a little bit [like this was similar to] my funeral because people speak about you and how you were, so it was little bit interesting on that front. I don’t need to die anymore because I know what it’s like! That is quite interesting but I must say, apart from a little sense of humour, I would like to thank everybody who has been nice to me. It’s our job because I certainly got more praise than I deserved and maybe sometimes more criticism than I deserved. It has been difficult but also fantastic. When Did Wenger Decide To Leave? Why Is Wenger Not seeing out The Final Year of His Current Contract? I just told you a few minutes ago that I would talk about that one day but it’s not the right moment. If you’re speaking about emotions, that certainly would be for me emotionally difficult. I don’t know how well I will live without that so at the moment its difficult for me to say never. But at the minute I speak to you, I’m too attached to this club to say I would go anywhere else. It’s too difficult for me. I will never completely leave this club, because my first look will always be for Arsenal and how well the club develops. I will always be attached, but it’s difficult. You do not give 22 years of your life like that. I gave the best years of my life to this club. I arrived at 46 years old and I worked seven days a week – not six or six and a half. Seven for 22 years! You cannot just walk away and say thank you very much and bye bye, it is absolutely normal. You cannot be on one side completely committed and after walk away like nothing happened – it’s impossible. I know I will face that challenge and that it will be difficult for me. But I had other difficulties in my life and I hope that I will get through this one as well. Has His Leaving Galvanised The Club? I don’t know. The club needs to prepare for the future and the earlier and more settled it is, the better. You cannot come in on 1 June and say look we separate now and do what you want. Maybe – I don’t know. It’s new for me. With Sir Alex Ferguson it was different, I agree with you. He’s still at the club though, he stayed at Manchester United. Will He Hang Up his Big Coat And Stop Coaching? Honestly, I can’t tell you much because I don’t want you to come back to me in six months and say that you lied to us. I know I did that a few times, but I would like to be definite today. I don’t know how I’ll respond to that situation. What Arsenal Need From The Next Boss? Look, you take me and take a guy who’s much stronger in every strong point that I have! Is He Relived To Be Going? No, because I was not tired, but I personally feel that this club is respect all over the world, much more than in England. 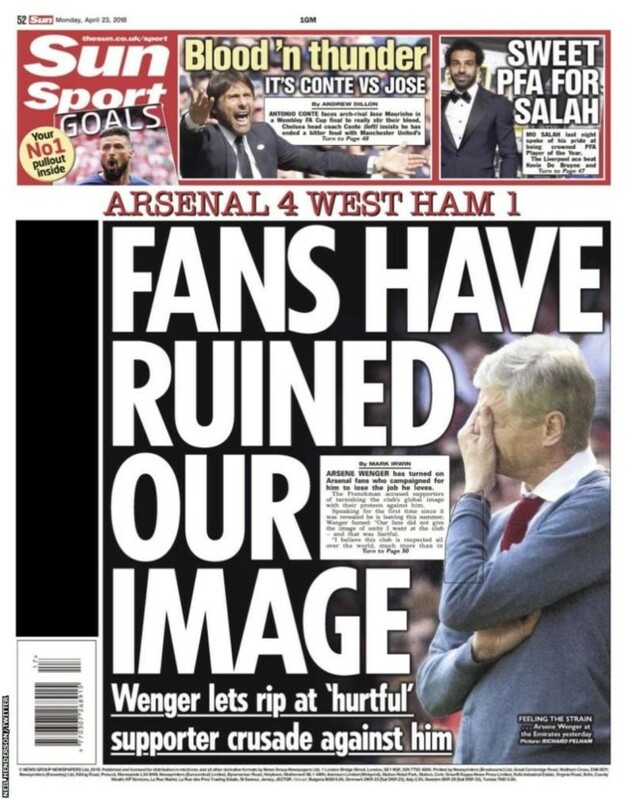 Our fans did not give the image of unity I want at the club all over the world and that was hurtful. I feel the club is respected and overall the image we gave from our club is not what it is and not what I like. We will try you know, we play against Atletico Madrid and it is very open. Hopefully we can continue to have positives results until the end and then we will see where we go from there. Did ‘Wenger Out’ Signs Hurt Him? I have nothing more to say. I feel this club has a fantastic image and for me that is absolutely vital. We can speak and speak and speak, sport is about winning and losing and you have to accept that you can lose games but it is about something bigger than winning and losing. For me that was always a worry, how the club is perceived worldwide for kids who play in Africa, in China, in America and the dream it can create for young children who want to play football and all of our clubs have a responsibility in that. 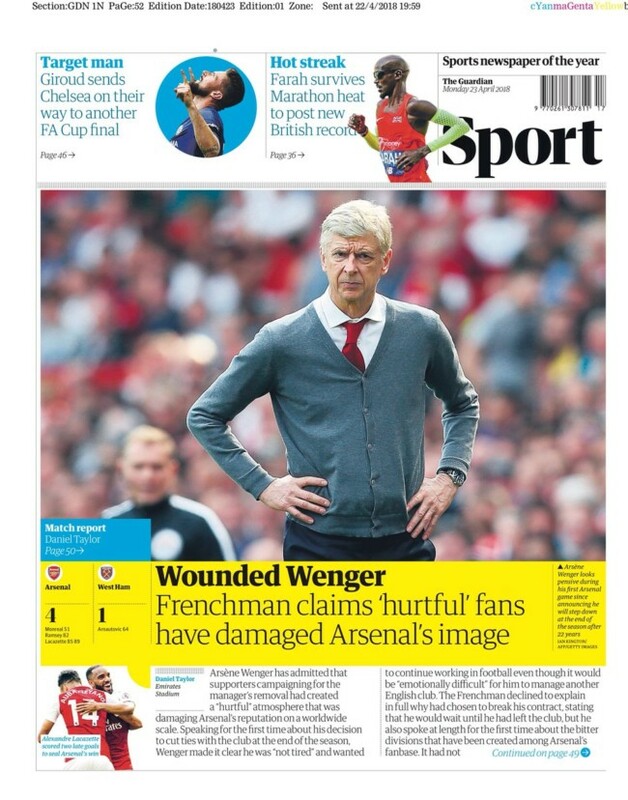 Did Anti-Wenger Fans Hurt The Club? I’m not resentful and I do not want to make stupid headlines. I’m not resentful with the fans, I just feel if my personality is in the way of what I think our club is, for me that is more important than me. That is what I want to say, it is nothing to do with the fans, the fans were not happy I can understand that, that is my job and I have to live with that, I can accept that. I don’t know if it was damaging but it was not corresponding with what I really feel our club is perceived and has to be perceived all over the world. I travel a lot and this club is respected all over the world and that is down to work and as well to the way we play football, the way we behave and the way we treat people. I want that to go on and to be respected and give the image I think is right. There is a lot of money in the game but above that is more than money, more than results, it is the way a club is perceived and the example a club gives all over the world. He’ll tell us more about his departure later – you know, when his book comes out.